Nicotiana affinis, also known as Nicotiana alata, is a classic tobacco plant with a delicious evening scent. It has been justly popular for over a century and a firm favourite with generations of gardeners: it is far lovelier than the modern improved forms of Nicotiana alata. The blooms are open and colourful by day and intoxicatingly fragrant in the evening and will bloom from early summer to first frosts. In a warm sheltered site it is a short lived perennial. Nicotiana are virtually maintenance free and is seldom bothered by pests, all they need is water and sun! Nicotiana affinis var. 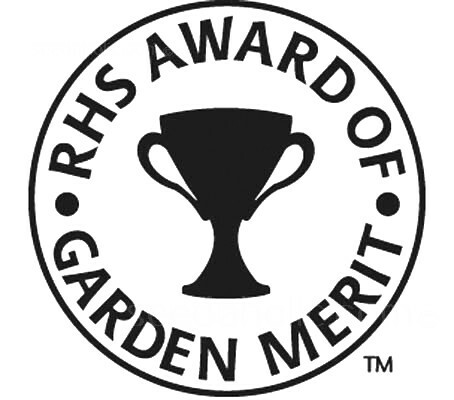 grandiflora has been awarded the RHS Award of Garden Merit (AGM). Nicotiana grows best in full sun in average, well-drained soil but will tolerate light shade. They are easy to start from seed and flower in about 10 weeks. Nicotiana seed is very tiny so whether you are starting seed indoors or planting directly in the garden, it may help to mix the fine seed with sand before spreading it over the ground. Sow very thinly - there really are a lot of seeds in the pack and they germinate well. This will also prevent overcrowding when it comes to transplanting and will reduce the risk of seedlings suffering from damping off. Start seed indoors about 4 to 8 weeks before the last frost in a flat, cells or pots that has been filled to within 6mm (¼in) of the top with moistened, seed starting mix. Sow seeds thinly on the surface and press gently into the surface. Do not cover the seeds, as nicotiana needs light to germinate. Place in a warm location, a room temperature of (70 to 75°F) is ideal. Keep moist, watering from the base of the pots, never on top of the seeds. Seeds begin to germinate in 10 to 14 days at temperatures of 18 to 22°C (65 to 68°F) When they have a couple of sets of leaves, thin to the strongest plant by pinching or cutting excess seedlings at the soil line. Plant outdoors after all danger of frost. Before transplanting the tender seedlings into the garden they need to be hardened-off, allowing them to adjust to the outdoor conditions. Place seedlings outdoors in a shaded or protected location for short periods of time, about 4 hours per day to start. Each day, leave plants outdoors for a couple hours longer and gradually move into brighter light conditions. Check the soil often to make sure it's moist and water if necessary. After 10 to 14 days plant in the garden. Nicotiana can also be planted outdoors after the last frost directly where plants are to grow. Sow seeds on the surface and water in lightly to prevent the tiny seeds from washing or blowing away. Plant in fertile, moist free-draining soil in full sun to partial shade in a sheltered position. It will appreciate rotted organic matter being added to the soil before planting. Deadhead to prolong flowering and encourage new flower buds. Leave a few plants to die down and self seed. Others can be pulled up and composted. These garden species are native to tropical South America, primarily Brazil, Argentina and Bolivia. Introduced into garden cultivation in the early 1800's it was prized for its white, highly scented flowers that opened at night. Nicotiana belongs to the large and diverse Solanaceae or Nightshade family, which includes many important edible and ornamental plants. Its closest flower relative is the petunia and it is also related to tomatoes, peppers, eggplants and potatoes. There are over 60 species of nicotianas but only a few are important in the ornamental flower garden. The story of ornamental flowering tobaccos is overshadowed by the well-documented travels of smoking tobacco, Nicotiana tabacum from the New World to cultures around the globe. 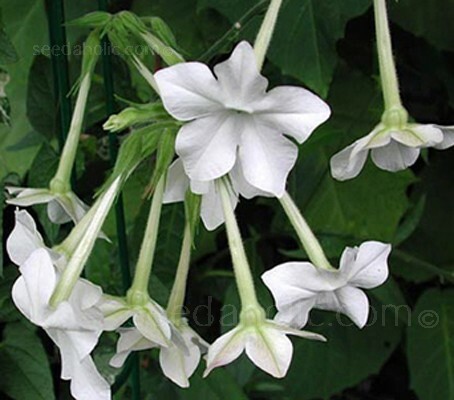 The first of the ornamental nicotianas to gain garden popularity was Nicotiana alata. Introduced into garden cultivation in the United States and England in the early 1800's it was prized for its white, highly scented flowers that opened at night. The poet Edna St. Vincent Millay wrote "Where at dusk the dumb white nicotine awakes and utters her fragrance in a garden sleeping." The genus name was designated by Linnaeus in 1753, however it was originally named by Leonhart Fuchs (1501-1566) who coined the name ‘Nicotiana’ after Frenchman Jean Nicot, ambassador to Portugal from 1559-1561. It is reported that he sent seeds of the plant to Francois II and the French court c.1559 and brought powdered tobacco to France to cure the Queen's son of migraine headaches. Nicot is also credited as the first to bring the plant to Europe but this is incorrect as it was known in the Low Countries after being brought there by Spanish merchants in the 1540’s. Knowledge of the plant by Europeans dates from 1492 when Columbus’s sailors saw it being smoked in Cuba and Haiti. Nicotiana alata gets its species name from the Latin alata, meaning winged, for the winged petioles of the leaves. It has the synonym Nicotiana affinis. The alternate species name is from the Latin affinis, taxonomic terminology which can be translated as 'closely related to, or akin to'. It indicates that available material or evidence suggests that the proposed species is related to, has an affinity to, but is not identical to, the species with the binomial name that follows. It is commonly abbreviated to: sp. aff., aff., or affin. The variant name grandiflora is from the Latin grandis meaning grand, and floris meaning flower, so 'bearing large flowers'. Commonly referred to as tobacco plants, many species of Nicotiana are cultivated as ornamental garden plants. Nicotiana tabacum is the species that is grown worldwide for production of tobacco leaf for cigarettes and other tobacco products. Sow in Spring, March to May.